The instructions given below step you through the installation of Geocortex Reporting, including component installation, post-installation configuration, and registering the application with ArcGIS. When you have completed these steps, you will have a working installation of Geocortex Reporting. Before you begin, download a copy of the installation package. For information about system requirements, see Requirements for On-Premises Reporting. 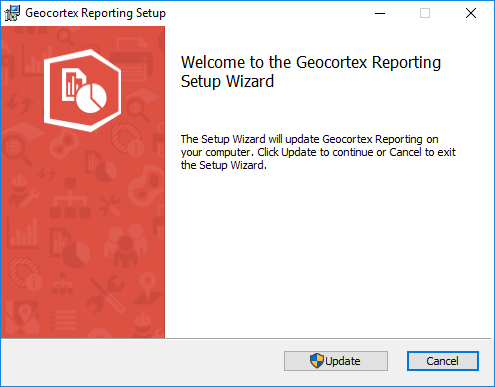 Run the Geocortex Reporting installer. The End-User License Agreement panel opens. To print a copy of the agreement for your records, click Print. If you agree to the terms of the license agreement and supporting documents, select the I accept the terms in the License Agreement checkbox, and then click Next. The Destination Folder panel opens. 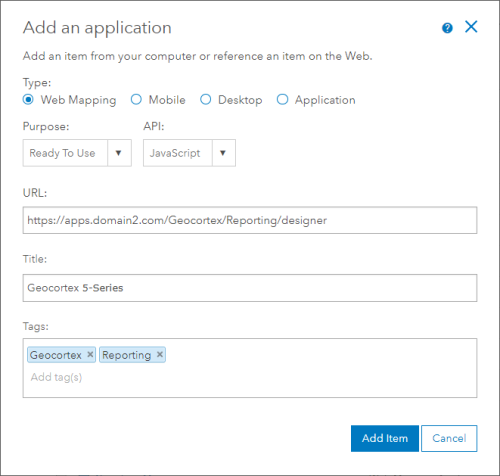 Select a location to install Geocortex Reporting, and then click Next. 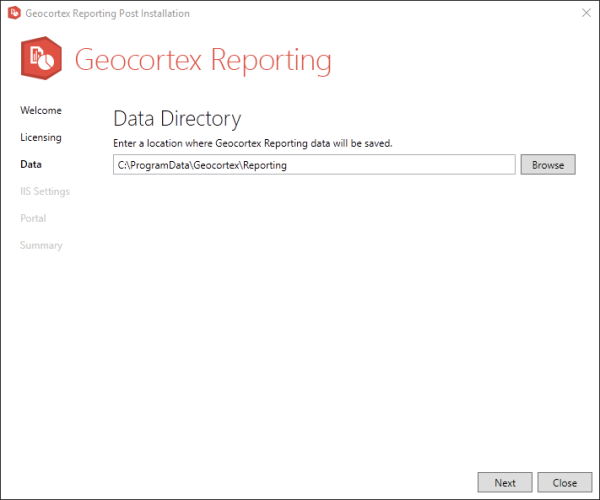 By default, Geocortex Reporting is installed in C:\Program Files\Latitude Geographics\Geocortex Reporting\. The Ready to Install panel opens. 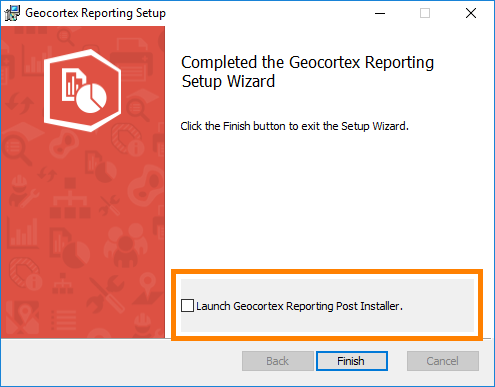 Make sure the Launch Geocortex Reporting Post Installer checkbox is selected and click Finish. Follow the steps in Configure Post-Installation Settings. The Geocortex Reporting Post Installer is used to configure on-premises deployments of Geocortex Reporting. You must configure the post-installation settings before you can run your on-premises installation of Geocortex Reporting. 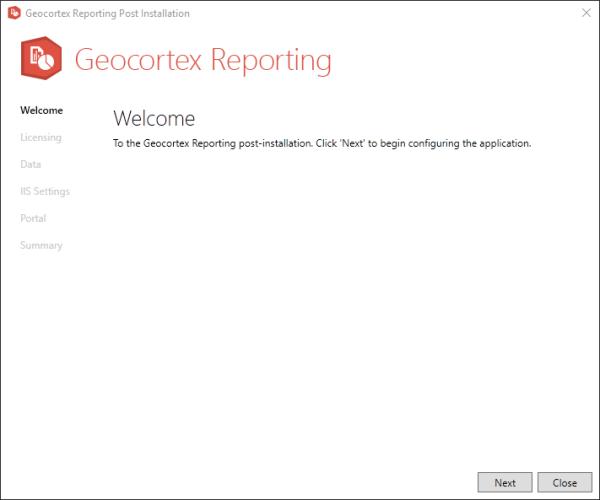 By default, when you install Geocortex Reporting on premises, the Post Installer opens after the installer completes. This allows you to do the required post-installation configuration right away. You can run the Post Installer at any time later to modify your configuration. Data: Select a data storage location. IIS Settings: Configure Geocortex Reporting's deployment in IIS. Portal: Register the application with Portal for ArcGIS or ArcGIS Online. 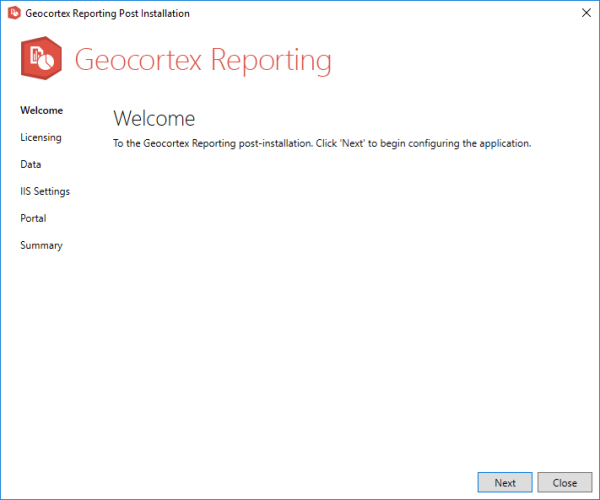 If this is the first time you have run the Post Installer after installing Geocortex Reporting on premises, you must visit every panel in the Post Installer and click Next to apply the settings on the panel. If you navigate away from a panel by clicking a link in the sidebar, the configuration for that panel will not be applied, regardless of whether you are using the default configuration or a custom configuration. Geocortex Reporting is licensed software. The Licensing panel allows you to activate the product. Activate Online: To activate Geocortex Reporting online, you must have a Geocortex account. Sign in to your Geocortex account. If your organization already has a license, activation will complete automatically. If your organization does not have a license, the Post Installer will create a trial license, provided your organization has not previously had a trial license for Geocortex Reporting. 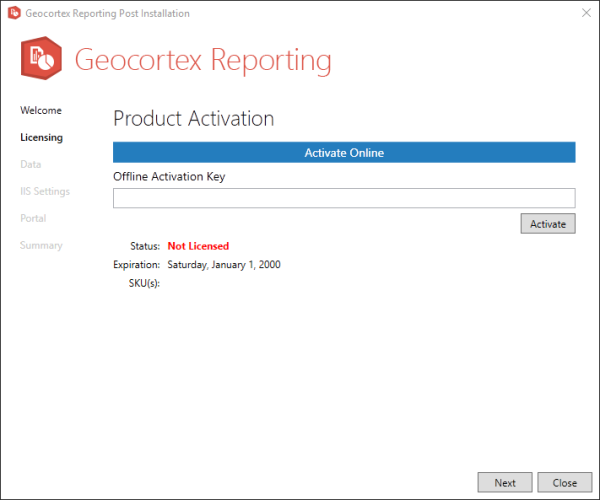 Activate Offline: To activate Geocortex Reporting offline, contact Geocortex Support at support@latitudegeo.com to request an activation key. When you receive the key, launch the Post Installer and open the Licensing panel. Paste the key into the Offline Activation Key box and click Activate. Click Close to close the Post Installer. The Data panel allows you to select a location for Geocortex Reporting to store intermediate data that is produced when a report is generated. If you want to store data in a custom location, click Browse and select the folder that you want to use. By default, Geocortex Reporting stores data in C:\Program Data\Geocortex\Reporting. 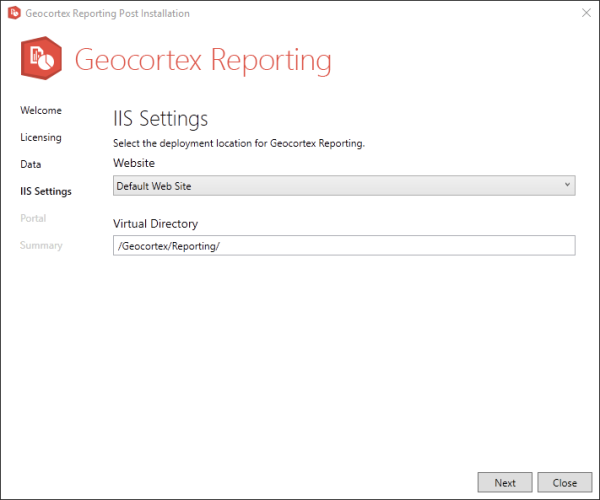 The IIS Settings panel allows you to manage how Geocortex Reporting is deployed in IIS. Open the IIS Settings panel. To use a different website, select the website from the Website drop-down list. By default, Geocortex Reporting is deployed to IIS's Default Web Site. To use a different virtual directory, type the path in the Virtual Directory box. 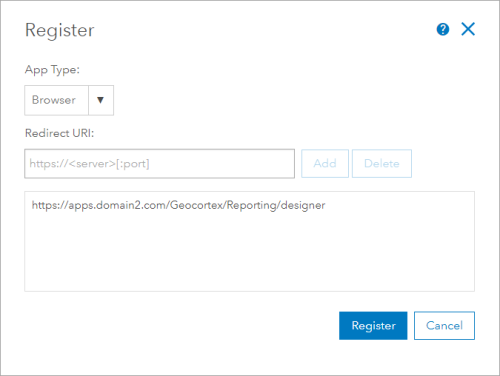 By default, Geocortex Reporting uses Geocortex/Reporting as the virtual directory. 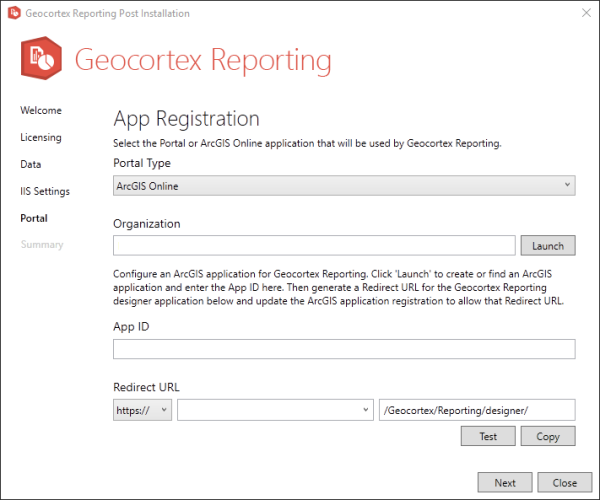 In order to save and share reports, Geocortex Reporting must be registered with an ArcGIS portal, either your Portal for ArcGIS installation or ArcGIS Online. To register with a portal, you create an application and register the application to create an app ID. You then copy the app ID to the Post Installer. If your organization has more than one Geocortex 5-series application installed on premises, we recommend that you use the same portal and app ID for them all. This provides single sign-on between the designers, so you can switch freely between them without having to sign in again. Select the type of portal you are using from the Portal Type drop-down list—ArcGIS Online or Portal for ArcGIS. The steps to register Geocortex Reporting are the same regardless of which type of portal your organization uses. We strongly recommend that you use HTTPS to access ArcGIS. ArcGIS Online: In the Organization box, enter your ArcGIS organization name, for example myorganization, or the URL of your ArcGIS Online portal, for example, https://myorganization.maps.arcgis.com. Portal for ArcGIS: In the Portal URL box, enter the URL for your portal, for example, https://myportal.domain.com/arcgis/. Select the appropriate connection scheme for your Reporting server: http:// or https://. If the web applications that will host reports run on HTTPS then you must run Geocortex Reporting on HTTPS as well. Otherwise, the applications will not be able to connect. We strongly recommend that you use HTTPS to access Geocortex Reporting. Enter the host name of your Reporting server. Click Copy to copy the redirect URL to your clipboard for use in a later step. The virtual path is entered automatically based on your IIS configuration on the IIS Settings panel. Click Launch to open your Portal in the browser. Sign in to your portal and open the Content page. On the My Content tab, click Add Item and select An application. Configure the application using the following settings, and then click Add Item. URL: Paste the redirect URL that you copied in the previous step. You may want to add additional tags used by your organization. A new application is added to the portal. Click the Settings tab and scroll down to the Web Mapping Application section. Click Register beside App Registration. Paste the copied redirect URL into the Redirect URI box, and then click Add. The redirect URL is added to the list of permitted redirect URLs. Click Register to complete the application registration. Copy the App ID to your clipboard, switch to the Post Installer, and paste the ID into the App ID box. Click Test to test the application registration. The Post Installer will test your registration and either show a success message or prompt you to fix any errors. The Summary panel shows Report Designer's URL for you to distribute to report authors in your organization. The Summary panel also provides a link to launch Report Designer. Click Launch Report Designer or copy the URL under Designer URL for distribution to your team. Before other members of your organization can access Report Designer, you must share the application item that was created with your organization within your portal. For information, see Allow Authors to Modify Reports. Click Close to exit the Post Installer. 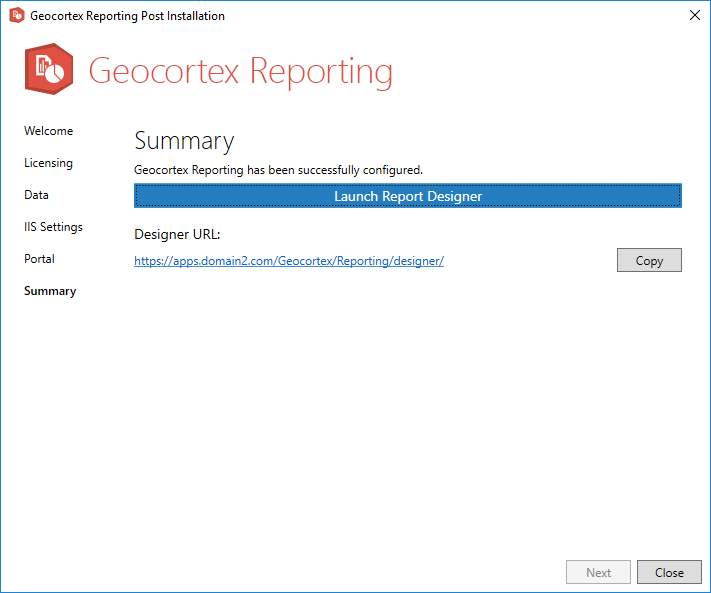 You have now completed the post-installation configuration and deployment of Geocortex Reporting. Navigate to the Geocortex Reporting folder in your file system and open the Setup subfolder. Geocortex periodically releases updates to on-premises Reporting that include new features and other improvements to the software. To update Reporting, run the new installer. The installer detects your existing installation and prompts you to update. If some of the files that need to be updated are being used, choose a method to proceed with the update and click OK.
Clear the Launch Geocortex Reporting Post Installer checkbox. Updating does not affect the existing configuration. You do not need to run the Post Installer after updating, unless you want to change the configuration. You have completed updating your on-premises installation.